During his drawing phase, Zhou Yu can draw an additional card. Once per turn, Zhou Yu can select a player and force them to choose a suit. Then, the target chooses one of Zhou Yu's hand cards. The card is then revealed, then placed in the target's hand. If the target guessed the suit incorrectly, they receive one unit of damage on behalf of Zhou Yu. Zhou Yu does not draw an extra card via "Brave Gesture" if he is the victim of Starvation and the judgement fails, as the drawing phase is skipped. When Zhou Yu targets somebody with "Sow Revolt," the target receives the card before they are damaged. For example, if Zhou Yu kills his target with this ability and the card that the target chose was a Peach, they could use the Peach to save his/herself from the brink of death. Zhou Yu must have at least one hand card to activate "Sow Revolt." "Brave Gesture" is very useful as it allows Zhou Yu to draw an additional card. This gives him a better chance of finding a card that he needs and it also offsets the card that he loses when activating "Sow Revolt." Sow Revolt allows Zhou Yu to do a large about of damage in a short amount of time, especially when he uses this ability in combination with attacking. Zhou Yu's "Sow Revolt" bypasses many defensive and deterrent abilities. A few examples are Yu Jin's "Heavy Resolve," Liu Shan's "Pleasure," and Zhang Jiao's "Lightning Strike." Unlike an Attack, Zhou Yu's "Sow Revolt" is not limited by distance restrictions. Zhou Yu can better control his opponent's card choice in "Sow Revolt" by using all the cards he can play during his turn before activating the ability. 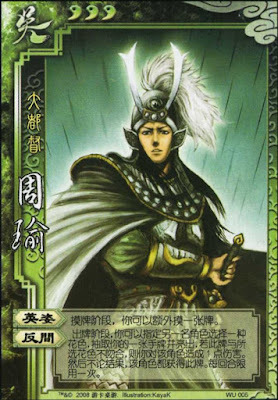 Zhou Yu excels in games with few characters as can draw as additional card via "Brave Gesture" more often. Furthermore, with fewer characters on each team, it is less likely for an enemy to be saved by a teammate, so Zhou Yu's strategy of dealing a large amount of damage in a short amount of time becomes stronger. "Sow Revolt" is not without its weaknesses. If Zhou Yu has useful cards in his hand, this ability will not be as useful as there is the possibility that he may give away a useful card. This happens more often than one would think, as it is common for players to save Peaches for dying teammates. Additionally, there is an approximately 25% chance that the target will guess the suit correctly, avoiding the damage while still being able to keep the card. Characters with retaliatory abilities are bad targets for "Sow Revolt," as this ability already has a built-in cost of the target taking one of Zhou Yu's hand cards. With only three units of health, Zhou Yu is fragile. Adding to the problem is that Zhou Yu has no inherently defensive abilities. The only thing he can rely upon is the additional card that he draws via "Brave Gesture." Zhou Yu is weak in games with many players, as he gets fewer opportunities to draw an additional card via "Brave Gesture." Sima Yi/Xiahou Dun/Fa Zheng/New Fa Zheng - These characters have retaliatory abilities that go into effect when they receive damage. As a result, it is even more expensive for Zhou Yu to use "Sow Revolt" on these characters. Guo Jia - When Guo Jia is damaged via "Sow Revolt," he draws the two cards via "Bequeathed Strategy" and takes the hand card from Zhou Yu. This trade off often works out in Guo Jia's Favor. Xu Huang - When Zhou Yu is plagued by Starvation, he is missing out on not just two cards, but also the additional one via "Brave Gesture." As a result, Xu Huang's "Blockade" is particularly effective on him. Xiao Qiao - When Zhou Yu uses "Brave Gesture" on Xiao Qiao, her "Beauty" converts spade-suited cards into heart-suited cards. As a result, she has a better chance than usual of passing this ability without taking damage if she picks heart when targeted by "Sow Revolt." King Zhou Yu is a mediocre king. With only three health and very little in terms of defensive abilities, he will likely die quickly without the support of great loyalists. Zhou Yu is a serviceable loyalist as he can kill rebels quickly with "Sow Revolt." Rebel Zhou Yu is a serviceable rebel as he can always target the king via "Sow Revolt" without worrying about distance restrictions. Spy Zhou Yu is a serviceable, but not outstanding spy. His "Sow Revolt" can be used to even the playing field quickly, but with little in terms of defensive abilities he may not be able to last the entire game. Zhou Yu is an interesting character. He handles most roles reasonably well, but it is more important to note the number of players in a game instead of your role when deciding whether or not to use him. As stated in the Advantages/Disadvantages section, Zhou Yu is better in games with fewer players than in ones in which there are more players. Also, do not overuse "Sow Revolt," especially if you have important cards such as Negate, Peach, or Escape in your hand. It is particularly frustrating when your opponent selects a useful card and guesses the suit correctly.